Much of the week has been cold and misty, occasionally downright wet. It hasn't suited the flowering plants. Erythronium should be reaching perfection but those with open flowers have suffered in cold winds and are looking tired. Fortunately the main display of E. 'Pagoda' was still in bud, and I have high hopes for them if the warm weather returns. It has also been Pleione week, a poorly defined time when the Pleione are at their very best. Most of the plants in the warmer greenhouse are in flower, a few have gone over and a few are yet to come so I think this is the peak. With Erythronium and Pleione filling the garden and greenhouse it is no surprise that I have, somewhat perversely, found other things to show here. This first Acer fails to demonstrate the quiet understatement of foliage. 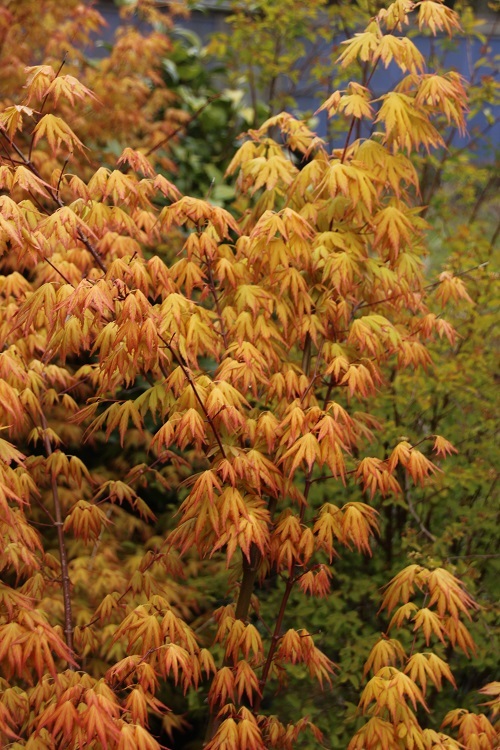 I grow a few forms of Acer palmatum, as much for amusement as anything else. Some of them colour in the autumn, others simply shed their leaves to the winter as gracelessly as I shed my clothes before slipping into the bath. I generally dress again in something warm, shapeless and elasticated, however some of the Acer cover themselves in springtime glory. 'Orange Dream' is an example, the new foliage is as good as anything it ever does in autumn, and much more reliable. It is a delight in the garden though I chose a photograph that doesn't show the adjacent Magnolia 'Susan'. The combination of the orange Acer foliage and the distinctive mauve banana-buds of the Magnolia is not unpleasant but unusual, unexpected possibly even unwieldy. Like concrete cutlery, it doesn't quite work as expected. I have a passion for Calanthe like the unrequited loves of youth. The sting has faded only the depth of feeling remains, without form or dimension. Tenuous as the echo when you shout into the fog. Because the truth of the matter is that Calanthe have no passion for me. I can change that, I am sure I can change that. I must be able to change that. Don't go, don't go endlessly muffled as the fog descends. Perhaps that is the long way of saying that I have grown a lot of Calanthe, they are all dead and I don't think I learned anything useful in the killing. But I still yearn. If I ever sat quietly waiting for a bus my eyes would be filled with distant Calanthe yearning. Gardening, in case you were in any doubt, has nothing to do with pots and lawnmowers it is the magical conjuring of the earths passions. Well, you can live in that world until you are emotionally exhausted, and then you have another go. 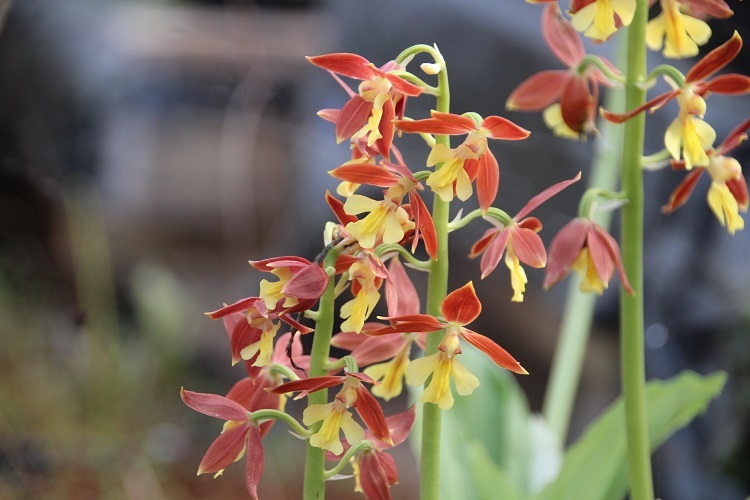 Thanks to Kew Gardens for planting a Calanthe in an "impossible" place and demonstrating that I had become overly self-involved. Second time around things have gone better. In the intervening decade plant breeding has moved on, the plants available now are complex seed strains raised in flasks and grown on in greenhouses. I call this one 'No.1' because I couldn't think of anything better. After the event I discovered that it would have had a label on the pot with a number, representing the breeders hybrid. The parentage is recorded. Unfortunately by then the pot was history, the family tree recycled into oblivion. So this is 'No.1', growing well, flowering reliably, larger than last year. Everything the remaining flickers of yearning youth could possibly want. One of the great arts of the cinematographer lies in separating joy and horror and then subtly reblending them until they are evenly distributed but still distinct. As we all know in real life the two things appear together, the one always holding the other in check. So it is with Camellia. If you have a small collection scattered around a garden each moment of joy will be moderated, almost immediately, by a nighmare of horror. The genus does both with aplomb, scarcely seeming to know the difference. Fascinatingly, one persons joy is anothers horror and there seems to be no middle ground, no Camellia that could be described as "alright, I suppose". It isn't as simple as large or small, delicate or blowsy, subtle or bright. Some are joyful, others stalk the dark corridors of the mind with sinister intent. That'a what I think anyway. In my world, C. rosthonii is a matchless beauty. I watch the red tinged white buds swell along the drooping branches like cascading diamonds, knowing that there is a perfect moment in store. It has arrived, neither camera nor cameraman has captured it, you will have to take my word for it. Standing transfixed on the concrete path in the greenhouse with a large and prickly Mahonia attempting to embrace me, C. rosthonii quietly performed its little miracle of wonder for me. 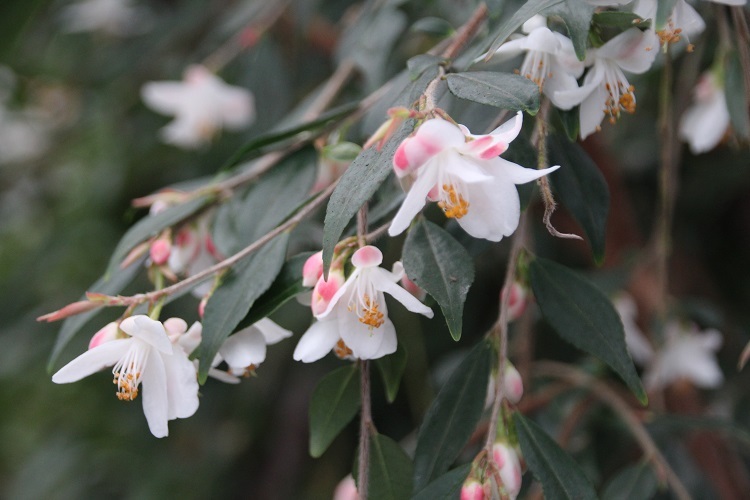 This is a cultivar called 'Elina', sold as CUPIDO, protected under plant breeders rights. I have no idea how it differs from the typical form of the species, the patent is a little vague on the subject. It doesn't matter, some things are perfect, it doesn't need to be explained. 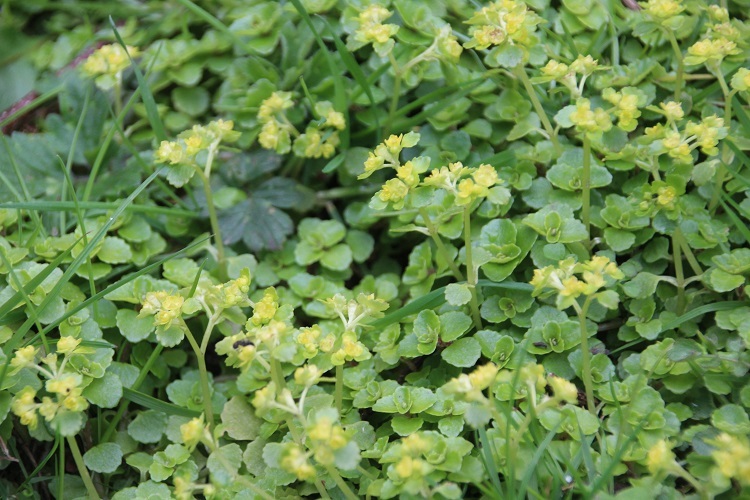 I have done without Pleione and put aside Erythronium for the week to walk on a carpet of curiosity, for that is my experience of the Golden Saxifrage. I am accustomed to seeing it growing in damp woodlands and by the sides of streams. I have often seen it playfully softening the hard rock beneath a gentle illusion of comfort. I am not used to seeing it in my garden. I was surprised, amazed, bemused, befuddled. In the modern parlance I was gob-smacked. Perhaps some background will explain. My garden was a field. Not a tumbledown romatic meadowy field effervescent with orchids, mine was a windy field of close cropped grass full of cows. It had been that way for as long as anyone could remember, no trees, no shade, no tumbling sheltered brook. In short, no possible habitat for a Golden Saxifrage. Nor any nearby habitat, possible habitat or even suggested memory of a habitat. Just grass and cows. I have planted trees, cleared ground, spread mulch and now in the low places the soil moisture soothes the gardens slumbers. And suddenly I have the Golden Saxifrage. I can't imagine how it got here, perhaps the seeds rain constantly from the sky, just waiting for a suitable place to grow. I don't know, I can't offer a suggestion that I have any confidence in. I am perplexed, overjoyed, wobbling with wonder and I constantly feel that I have dressed for the wrong event. Spring is surging through the garden and I can feel it.